She used Love Sentiments set. Colors and papers she used is so cute and the layout is so fun! Thanks Lisa! I'm hoping I have time for working on some new digis this weekend... Have a great weekend everyone! Oh lovin' the patchwork look! Just gorgeous! I've just posted another card with your Lovely couple digi in my blog if you want to have a look! It's a great digi!!! 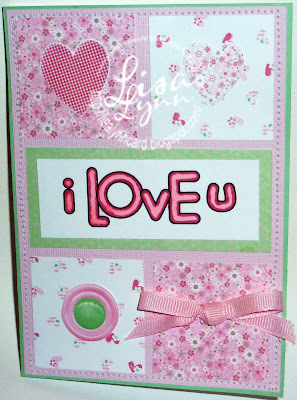 Really pretty card, lovel;y layout!